Located in one of the most exclusive residential areas of the north of Madrid, Majadahonda, the Gran Plaza 2 Shopping Centre is found, a spectacular 600,000m2 commercial space with around 200 establishments and the best brands, in which the design of BigBox Street stands out. 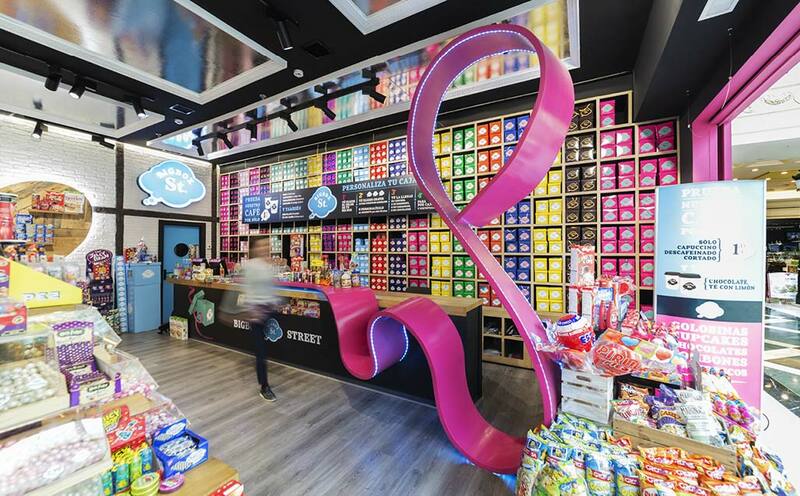 It is difficult to categorise BigBox Street, a gourmet sweet shop with imported products, soft drinks, cupcakes, cookies, chocolates, etc., all with the common factor of their characteristic colourful boxes. The idea is that the client can fill a BigBox Street box with everything they like, select its colour and accompany it with a personalised message of their choice. We can find the solid surface from PORCELANOSA Group, KRION, in the 6403 Candy colour, transformed into a winding bow that flows downwards from the ceiling, zigzagging to the floor, making various twists before widening the counter of the shop. The bow was designed and patented by BigBox Street.